Handknit kids sweater in Peruvian Alpaca Boucle. Peruvian Alpaca - the best! Available in 5 great colors from newborn to toddler. Peruvian Alpaca is a luxury fiber, but one of it's secrets is versatility. This sweater features a no-itch boucle yarn which is very sensible. 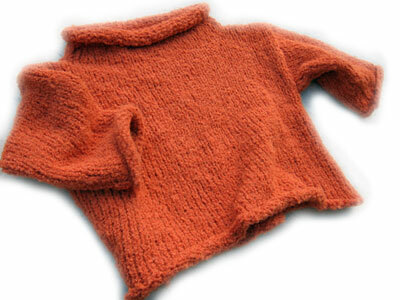 Much like down, this handknit keeps warmth in when you need it – yet allows air to breeze thru keeping kids comfy. In our world of uncontrollable climate change:(school bus/school yard or Subway/Street -- you know what I'm talking about) -- this is a must. Did I mention fashionable ? In these great fall colors , its a hand-me-down for sure. alpaca boucle yarn knit kit that makes it easy! Please note: Tomato, green, Iris and pumpkin are sold out in larger sizes - you can order them, but there is a 7-9 day delivery window.